An abundance of that juicy and refreshing summer fruit is right around the corner. What some don't know about this delicious, popular fruit is that those pesky seeds you end up spitting out actually have powerful health benefits. What's so glorious about fruits and seeds and plants and vegetables is the critical healing powers and properties within them that we may not even be fully aware of. Watermelon seed oil can be used in a whole host of different ways, and because of its high linoleic acid content, it makes for a highly impressive and effective oil. Here are some of the amazing ways watermelon seed oil can be implemented. If you have been suffering from high blood pressure, you are likely very aware that you need to get that issue under control. High blood pressure can lead to a whole host of other problems such as stroke, heart disease and a variance of other health issues. High blood pressure tends to be caused by incredibly stressful lifestyles, bad diets and sometimes genetics. Incorporating an oil like watermelon seed oil into your diet can provide you with the solution you've been searching for in reference to your high blood pressure. The amount of healthy fatty acids present in the oil helps to lower bad cholesterol and regulates blood pressure. One of the most invasive and increasing health concerns in our society is diabetes. This is a condition that affects the way that the body processes sugar. A lack of insulin can cause blood sugar levels to become elevated. Diabetes can affect a whole host of various parts of your body if not effectively treated and dealt with. Blood sugar levels that regularly get too high can lead to very critical issues. Watermelon seed oil helps to regulate blood sugar so that certain spikes are better controlled. The use of this oil will provide much needed balance to your levels. Though it has amazing benefits when taken internally, one of its most impressive and surprising is how it can be used to improve your skin. So many people struggle with their skin and finding products for it that work. With so many different skin types, it can sometimes be a bit confusing. Because of the consistency of the oil, the skin is easily penetrated by the oil, which helps to provide a vibrant, healthy glow after consistent use. It is also water soluble which means it can be absorbed quickly and easily. Because it is so lightweight, it helps to clear out the pores of those pesky entities that help to produce acne - things like dead skin cells, sebum and free radicals. The anti-aging properties that are present within the oil will also help with any type of wrinkles, age spots and sagging skin. One of the signs of skin that isn't being taken care of is the premature signs of aging. This is why you must stay ahead of the curve. Watermelon seed oil can do that for you. 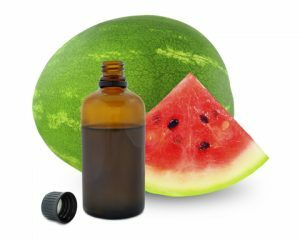 You can purchase watermelon seed oil online from several companies at amazon.com.